A new county-by-county index shows how difficult it is for seniors to make ends meet in Wisconsin. While many of the state&apos;s elderly are not poor, they&apos;re also not thriving. 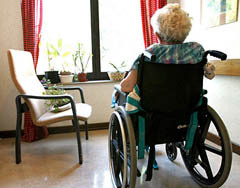 Elders living alone in Wisconsin need between $16,000 and $22,000 to cover basic living costs — a stark contrast to the federal poverty level standard of $10,400 for a single person. The just released Elder Economic Security Standard Index shows couples need between $25,000 and $33,000 to meet basic household budgets — while the federal poverty level standard stands at $14,000 for a couple. Ramsey Alwin with Washington D.C. based Wider Opportunities for Women says the index uses an income measure that reflects the basic needs of older adults. "It provides a no-frills budget," said Alwin at a state Capitol press conference Tuesday. "It doesn&apos;t include ordering a pizza or even gifts for grandchildren. It illustrates basic economic and health security." State Sen. Jon Erpenbach believes the index also illustrates a major problem with how we define poverty. "The federal poverty level needs to be a lot more realistic," said the Middleton Democrat. "The cost of transportation has gone up, obviously. Because transportation has gone up, the cost of food has gone up, the cost of everything has gone up, but not as much as the costs of health care." Those costs can be financially crippling, as Linda Marty-Schmidt learned while helping her elderly parents, who receive $1600 in Social Security and $1400 in Veterans Administration benefits each month. "A year ago we moved them into an assisted living facility," said Marty-Schmidt. "It&apos;s not what they wanted, and I wish they could have stayed home." "For many seniors there is a financial gap, between their income, and what it takes to meet basic living costs," said Sharon Wisniewski with the Wisconsin Women&apos;s Network . "That is true not just for the very poor, but for those living above the seriously outmoded federal poverty standard." Erpenbach and state Rep. John Townsend , who chair the committees on aging in their respective chambers of the legislature, both praised the findings of the index, and said it will be an important resource in defining future public policy.